Walking with Jesus: Romans, Day 34: Romans 12:3-8 - What is the Most Vital, Misunderstood and Undervalued Virtue? Romans, Day 34: Romans 12:3-8 - What is the Most Vital, Misunderstood and Undervalued Virtue? What is the Most Vital, Misunderstood and Undervalued Virtue? In all humility, I think I can honestly say that I am not a very humble person. I am always wondering what other people think of me, whether they like me or not. I am too easily irritated when I don't get my way or something gets in the way of my accomplishing some goal. I tend to see everything that needs to get done or fixed as my responsibility and everything that goes wrong as my fault. Now you might call these things insecurity or control issues or false guilt, but I know that at the heart of these issues is excessive pride and a lack of humility. I just spent the whole first paragraph of a post about humility talking about myself! Few things are more misunderstood or undervalued as humility. When most people think of humility, they probably picture Eeyore, the gloomy pessimist. Or perhaps they think of someone who is always beating themselves up for their shortcomings. Yet these things are often rooted in pride, because I think the world is out to get me or I think that I should be better than I am. 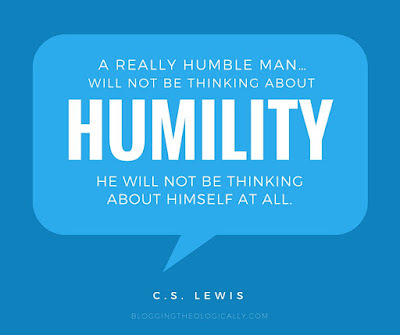 Why is humility so valuable? Because it frees us to truly love others and to enjoy the life God has given us. Humility is a key to unlocking love and joy. It also bears fruit in all of our relationships. Within the body of Christ, humility is a vital virtue for the right exercise of spiritual gifts. Instead of wondering whether someone else's gift is better or worse than mine, or trying hard to get people to recognize me for my gift, humility frees me to simply use my gift to serve others. When everyone in the body of Christ uses his or her giftedness to serve others, the church grows and thrives to the glory of God! Humility is much misunderstood, almost always undervalued, and yet vital to living the life God has given us with gratitude, joy and love. How do we get humility? Not by wanting to be more humble or by beating ourselves up for our lack of it, but by focusing more on Jesus. Fixing our eyes on Him and seeing His greatness in our lives and the lives of others is the way the Holy Spirit cultivates humility in our lives.